A classic black and white photograph of Hall of Fame manager Casey Stengel, beautifully framed and ready for hanging on any wall in your home or office. 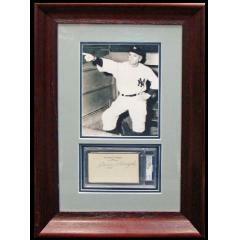 Every loyal Yankees fan will want this one for their own. 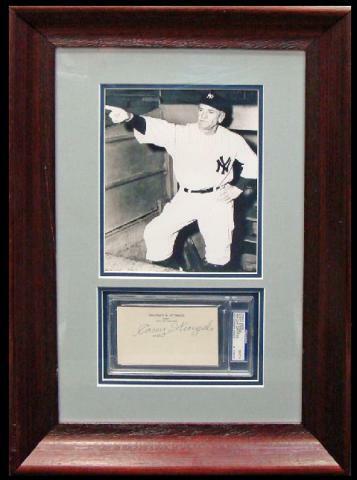 What really makes this piece special is the addition of an authenticated Stengel autograph - slabbed and framed with the photo - with certification by PSA/DNA. Get this one now before it is gone. Due to the rare nature of this item we will charge your credit card for the full price immediately upon taking your order. This policy ensures we reserve the piece for you. We will confirm your order by Email. Please allow at least 2 weeks for delivery.